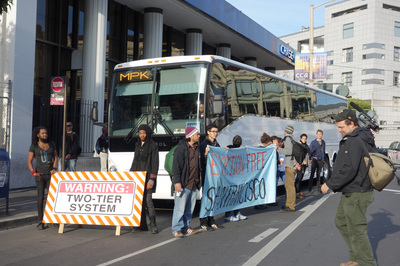 Since our first Google bus protest on December 9, 2013, organizers and tenants facing eviction have been quoted, misquoted, and decontextualized. This is an attempt to clarify facts many of the news outlets choose to skew. 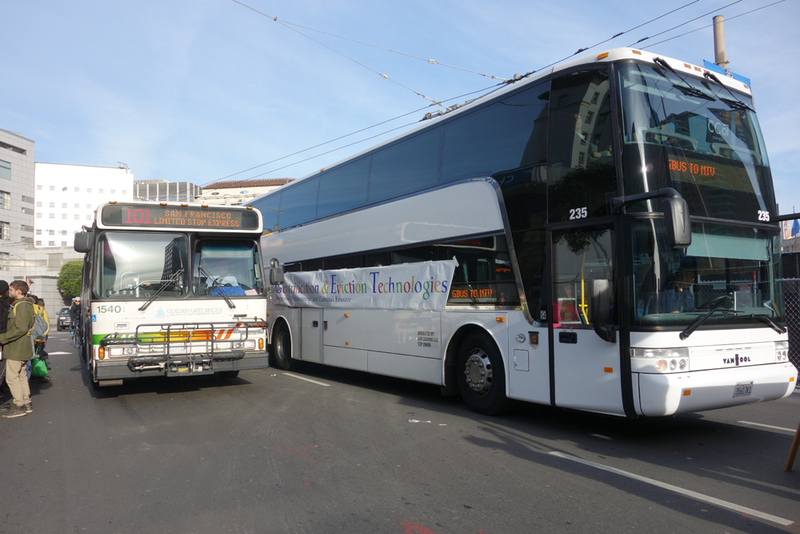 Big tech exploits San Francisco’s cultural diversity and public infrastructure to lure workers here. 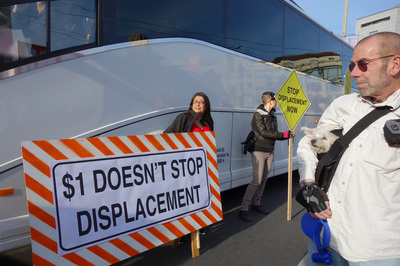 Real estate speculators capitalize on the influx of high-wage earners by evicting long-time residents to rent units at inflated rates, commanding up to twenty percent more around tech shuttle stops. Speculative real estate takes advantage of the new tech class, using the Ellis Act, Buy-Outs, rent increases, and harassment to replace poor and working-class tenants with the new upwardly mobile tech workers. Since the emergence of the Tech Boom 2.0, we have seen no-fault evictions up eighty-three percent. Over the last twelve months, we have seen Ellis Act evictions up 170 percent. We have seen evictions skyrocket in the South of Market neighborhood surrounding Twitter, rising from seven to 270 in one year alone. Tenants, many who have spent decades here, are either facing displacement or are living in constant fear of being evicted. Small mom-and-pop shops are going out of business as the new tech class fails to frequent them (many of their needs are met by the corporations for which they work). Long-time organizations and businesses are being evicted to make room for commercial tenants creating high-end boutique markets to serve new, affluent residents. To long-time residents and merchants facing eviction, San Francisco is not a “perk.” It is their life, livelihood, family, chosen family, and safety net. One cannot monetize the disruption of their entire lives nor measure the impact of uprooting people in mere carbon levels. Nevertheless, the emission created through such devastation, in addition to the consumption levels of a wealthier population, far outweigh any savings these limo-buses may provide. Prior to the Jan. 21st SFMTA board meeting, Google urged their employees to say that they would drive if the not for the shuttles, even though the SFMTA had previously published a survey stating that 50.5% of private shuttle riders would not drive their own cars if these shuttles weren't available. Thirty-one percent said they wouldn't be able to make the trip at all, which implies over 5,200 people would choose to live closer to their work in Silicon Valley. None of the surveys on the environmental impact of the shuttles are taking into account how many people have been priced out or displaced, who now have to drive from across the Bay to their jobs in SF. Corporations have historically had a giant footprint on public infrastructure, communities and the environment without paying for it, and Google is no different. 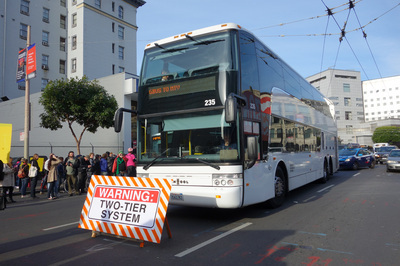 They'll avoid paying for privatizing our bus stops like they avoid paying $11 billion in federal taxes. When a company's chairman publicly says, "We're proudly capitalistic. I'm not confused about this," you know Don't Be Evil was just a sick joke of the Googlezillionaires. In regards to building communities that take care of each other and the planet and stopping capitalist exploitation in its tracks, we support a diversity of tactics. 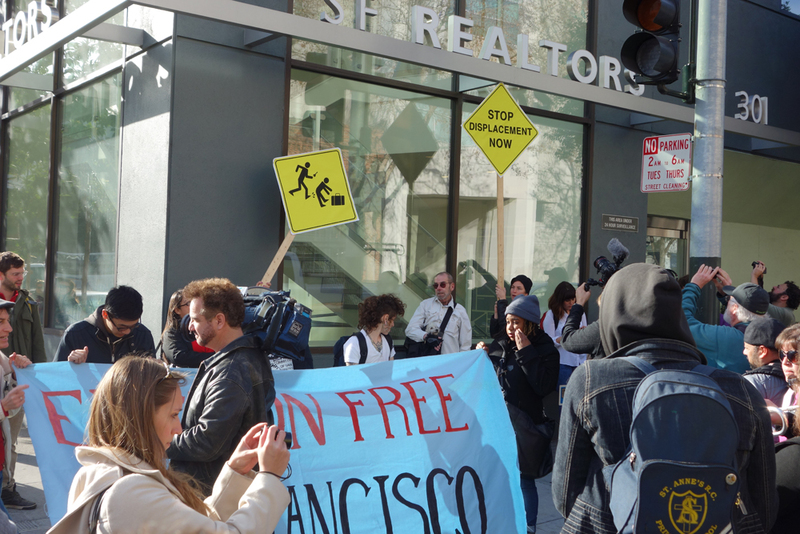 We recognized that gentrification in San Francisco results in similar shifts in the East Bay. 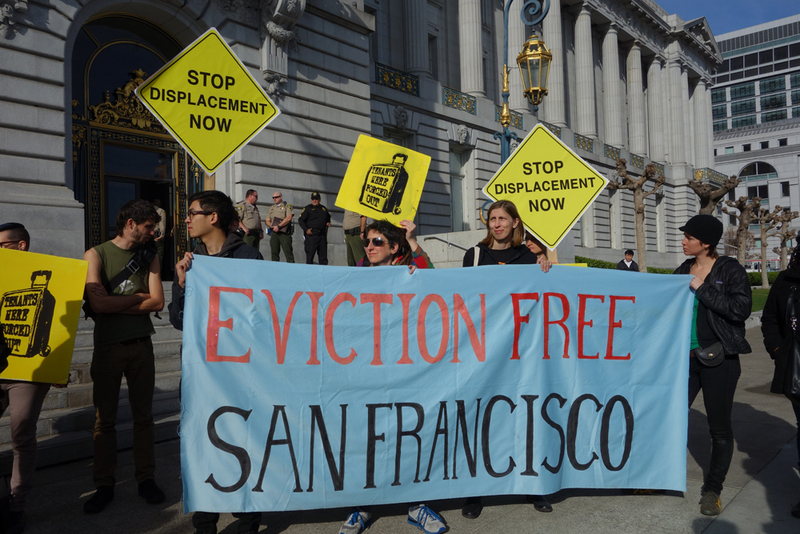 We encourage different communities to organize and take action to fight displacement. Together, long-time residents, the dispossessed, the disenfranchised, the undocumented, the indigenous, queers, artists, immigrants, refugees, dreamers, and folks of all backgrounds have a right to our cities. San Francisco has long been a haven for marginal communities. It has offered sanctuary. It has offered health care services for queer and transgender folks, some of the top doctors in the country for fighting AIDS, social services for indigenous, diasporic, and refugee communities. Today, we see it dispossessing the communities that it has historically sheltered, and instead privileging tech. The mayor visits tech companies every Tuesday. Why not tenants? People at risk of being displaced should be a part of the city's conversations regarding how the tech industry should mitigate its impact on communities. Why is the Mayor listening to Ron Conway over community groups? Who agreed to the terms in Twitter’s Community Benefit Agreement? Who was heard and who was ignored during the SFMTA Board meeting to instigate charging only $1 when private shuttle buses stop in our public bus zones? Who determined that housing and transportation were unrelated categories? Not us. Under capitalism, all the ways in which common resources are taken for private gain affect almost every aspect of our lives. Tech companies pay for their impact on housing and public infrastructure. They should fund: affordable housing initiatives, eviction defense, public transit service improvements, legislation initiatives to prevent speculators from using the Ellis Act & Costa Hawkins to evict residents, and so much more! 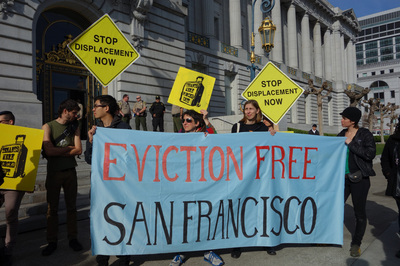 A moratorium on all no-fault evictions. Preservation of the heart of the city. A city that cares for its elders, artists, families, and culture. Investment in all people, not just tech. We will fight to save our city refuge and neighborhoods! We will not be washed away by this green-washing campaign, by big business, by corporate greed, or by corrupt politics. Whose homes? Our homes! Whose city? Our city!